Ameritopia is a recent book by the conservative political writer and radio commentator Mark Levin. Though the book made the New York Times bestseller list, it has largely been ignored by mainstream media. This is a shame, not because Levin provides us with anything radically new on the subject of utopia, but because his view is poised to become the prism through which a large number of Americans define the very idea of utopia, and therefore what this idea means to America’s past, present and future. A more balanced reading of America’s utopian history might permit Americans, whatever their political stripe, to take something positive from our utopian heritage. Levin structures his book by taking four authors as exemplary of the utopian mind-set: Plato, Thomas More, Hobbes and Karl Marx and contrasting them to what he believes to be thinkers in the anti-utopian camp: Montesquieu, John Locke, James Madison and Alexis de Tocqueville. Plato, More, Hobbes and Marx respectively represent rule by an intellectual elite (guardians), the suppression of human ambition and inequality, total control by the state, and the abolition of property. Their counterpoise respectively represent the separation of powers as a means to prevent tyranny, natural right and God given rights as the basis of a necessarily limited government power, the idea of American government as a limited form of government, the dangers of pursuing economic equality as opposed to the necessary equality of political and legal rights. Thing is, while Levin sees America as the heroic anti-utopia that through its political traditions and institutions has resisted utopian fantasies that have reigned elsewhere, Atwood sees America as the land of utopia defined by that dream more than any other society. Both can’t be right, or can they? Soon after I finished Ameritopia and read Atwood’s article I began to compile a list of American utopias or strands of utopian thought in America. The list soon became so long and tedious that I was afraid I’d lull my poor readers to sleep if I actually wrote the whole thing out. There had to be a better way to get all this information across, so I decided to make a slideshow. Immediately below is what I take to be a general history of utopia in America. Anyone interested in specifics can consult the slideshow. It should be noted from the outset that I probably missed more than I included and may have made some errors on multiple points. Any suggestions for corrections would be of help. The idea of America has been intertwined with the idea of utopia from the day Europeans discovered the New World. The discovery of the Americas became tied to anticipation and anxiety about the end of the world and the beginning of the reign of Christ on earth, it inspired a new golden age of utopian literature beginning with Thomas Moore, it became one of the main vectors through which the myth of the noble savage became popular in Europe. Many of the initial European settlements in the Americas either were themselves utopian experiments or gave rise to such experiments. America was seen as the place where utopian aspirations such as the end of poverty could in fact be realized, and the American republic was built from utopian themes such as equality. Throughout the early 19th century the United States was the primary location for utopian communities seeking to overcome the problems associated with industrial civilization. By the end of that century large numbers of Americans had placed their utopian hopes with technology and government control over the economy, a position that was not fundamentally shaken until the late 1960s when utopian aspirations in the United States flowered and took on a more communitarian, spiritual, liberation, and environment centric form. The end of the Cold War saw a further upsurge in utopian thought this time seen as an end to history and a further acceleration of wealth. Both aspirations were done in by political events such as 9-11, and the crash of stock market bubbles in 2000 and 2008. Click on image above to watch the slideshow. Given all this it is fair to ask how Levin could have gotten things so horribly wrong. Sometimes we are wrong about something precisely because we are right about something closely related to it. And Levin is write about this: that the founders well aware that they were engaged in a kind of bold continental sized experiment wanted to make sure that experiments of such a scale would be incredibly difficult to initiate in the future. They were especially leery of national experiments that might originate from the two major strands of utopian thinking in the past- economic and religious. No matter how critical we are of the gridlock of today which prohibits necessary systematic change it was probably one of the factors that helped prevent the radicalization of American society during the tumultuous first half of the 20th century- a period that saw much of the rest of the world succumb to fascist and communist dictatorships. For all its flaws, the system probably still keeps us safe from the extremes on either side of the political spectrum, and we should therefore be aware of what we are doing when we try to change it. Be that as it may, Levin gets this right and as a consequence misses the actual legacy of utopian thought in America. When large scale social and political experiments go wrong they can hurt a lot of people, the Soviet Union was one such experiment as is the European Union whose ultimate fate is today in doubt. The United States itself almost failed in its Civil War, which was the point made by Lincoln in his Gettysburg Address: “Now we are engaged in a great civil war, testing whether that nation or any nation so conceived and so dedicated can long endure”. Small scale utopias or even imagined utopias are much less dangerous. When they fail, as almost all do, they burn a lot less people. At the same time they serve as laboratories in which new ways of being in the world can be tested. The aspirations inspired by purely imagined utopias often spur real reform in society in which the real tries to meet the standard of the dreamed. In many ways the utopian tradition helped give rise to the society we have today. Certainly not utopia, but much more humane and just than the America these utopias were responding to in the 18th and 19th centuries. That is Ameritopia. Recently I had one of those incidents of intellectual synchronicity that happen to me from time to time. I had grudgingly, after years of resistance, set up a Twitter account (I still won’t do Facebook). For whatever reason Twitter reminded me of a book I had read eons ago by the Danish philosopher Søren Kierkegaard called The Present Age. I decided to dig the book out from the catacombs of my dusty attic to find out what my memory was hinting at. More on that synchronicity I mentioned later. The Present Age is Kierkegaard’s 1846 attempt to think through the spiritual and existential consequences of the new condition of a cheap and ubiquitous press. The industrial revolution wasn’t only about the accelerated production of goods, but also enabled the mass production of information. The art of printing was ripe for a revolution having remained essentially unchanged since Guttenberg in the 1400s. In 1814 the Times of London acquired a printing press with a speed of 1,100 impressions per minute. The widespread adoption of this technology gave rise to extremely cheap publications, the so-called, “penny press”, that were affordable for almost anyone who could read. The revolution in printing lit a fire under the mass literacy that had started with Guttenberg extending the printed word downward to embrace even the poorest segments of society and was facilitated by the spread of public education throughout the West. This revolution had given rise to “the public” the idea of a near universal audience of readers. While some authors, such as Charles Dickens, used this 19th century printing revolution to aim at universal appeal Søren Kierkegaard really wasn’t after a best seller status giving his works such catchy titles as Fear and Trembling. Kierkegaard wanted individuals to make choices. Such choices came with very real and often severe ethical consequences that the individual was responsible for, and that could not be dismissed. The ethical life meant a life of commitments which were by their very nature hard for the individual to fulfill. One of the main problems Kierkegaard saw with the new public that had been generated by the cheap press was that it turned everyone into a mere spectator. The public is a concept that could not have occurred in antiquity because the people en masse, in corpore, took part in any situation which arose, and were responsible for the actions of the individual, and moreover, the individual was personally present and had to submit at once to the applause or disapproval for his decision. Only when the sense of association in society is no longer strong enough to give life to concrete realities is the Press able to create that abstraction ‘the public’, consisting of unreal individuals who never are and can never be united in an actual situation or organization- and yet are held together as a whole” (60). The issue for Kierkegaard here is that, since the rise of the press, the world had become enveloped in this kind of sphere of knowledge which had become disconnected from our life as ethical and political beings. A reader had the illusion of being a participant in, say, some distant revolution, famine, or disaster, but it was just that, an illusion. Given how much this world commanded our ethical and political attention, when in reality we could do nothing about it, Kierkegaard thought people were likely to become ethically paralyzed in terms of those issues where we really could, and should, take individual responsibility. And now back to that synchronicity I had mentioned. Right around the same time I had dug up my dusty copy of The Present Age I was walking through the local library and happened to pass a 2011 book by Evgeny Morozov called The Net Delusion. On a whim I brought the book home and when I cracked it open to my surprise saw that he had a chapter dedicated to the Danish philosopher- Why Kierkegaard Hates Slacktivism. Morozov’s point was that the internet gives us this illusion of participation and action that requires very little on our part. We sign this or that petition or make this or that donation and walk away thinking that we have really done something. Real change, on the other hand, probably requires much more Kierkegaard-like levels of commitment. These are the types of commitments that demand things like the loss of our career, our personal life, and in the case of challenging dictatorships, perhaps the loss life itself. The ease of “doing something” offered by the internet, Morozov thought might have a real corrosive effect on these kinds of necessary sacrifices. It is here that synchronicity plot thickens, for both Kierkegaard and Morozov, despite their brilliance, miss almost identical political events that are right in front of them. As Walter Kaufmann in the introduction of my old copy of The Present Age points out Kierkegaard totally misses the coming Revolutions of 1848 that were to occur two years after his book came out. The Revolutions of 1848 were a series of revolts that ricocheted across the world challenging almost every European aristocracy with the demand for greater democratic and social rights. Rather than having acted as a force suppressing the desire for change, the new press allowed revolution to go viral with one revolt sparking another and then another all responding to local conditions, but also a reflecting a common demand for freedom and social security. Individuals acting in such revolutions were certainly taking on very real existential risks as states cracked down violently on the revolts. Similarly, Morozov’s Net Delusion, published just before the beginning of the 2011 Arab Spring, missed a global revolution that, whatever the impact of new technologies such as Twitter, were certainly facilitated rather than negatively impacted by such technologies. The Arab revolutions which spread like wild-fire inspired similar protests in the West such as the Occupy Wall Street Movement that seemed to require more than just pressing the “like button” on Facebook for the committed individuals that were engaged in the various occupations. When it came to the Revolutions of 1848, Kierkegaard was probably proven to be right in the end as the revolutions failed to be sustained in the face of conservative opposition paving the way for even more revolutionary upheaval in Europe in the next century. Only time will tell if a similar fate awaits the revolutions of 2011 with conservative forces regrouping in autocratic societies to stem any real change, and Western youth becoming exhausted by the deep ethical commitments required to achieve anything more than superficial change. Harper’s Magazine has an interesting interview with the Marxist political theorist Slavoj Ziizek. There Ziizek makes what I think are some critical mistakes regarding the OWS movement. Ziizek labels criticism focusing on concentration and cooruption in the financial system as what he calls the “fascist trap”. In effect drawing strong lessons from the Anti-Semitism of Great Depression era fascism to conclude that curent critiques of the financialization of the economy could likely veer off in the same dangerous direction. Now, any Anti-Semitic rhetoric coming out of the OWSM, or any where else, should be condemned in the strongest terms, as should the overly simplistic demonization of capitalist generally. But that doesn’t imply that we should not be able to speak about the issue of financial and economic concentration, and its overall impact on both politics and the economy. Someone suggesting that perhaps the system would be more robust if the big banks were forced to be smaller, as the conservative Niall Ferguson has done, or that the revolving doorbetween Washington, Wall Street, and Academeia should be at least partially closed should not be bundled up with blind belivers in conspiracy theories or truly fascist maniacs. It is by openly talking about these issues, rather than avoiding them, that Anti-Semitism or any other idiotic simplificaction of the complex world in which we live can be cut off at the root. But, for now, what if concentration (bigness) and not capitalism itself is the real problem? The picture above was produced by James Glattfelder et al and shows the 1318 companies that dominate the global economy. 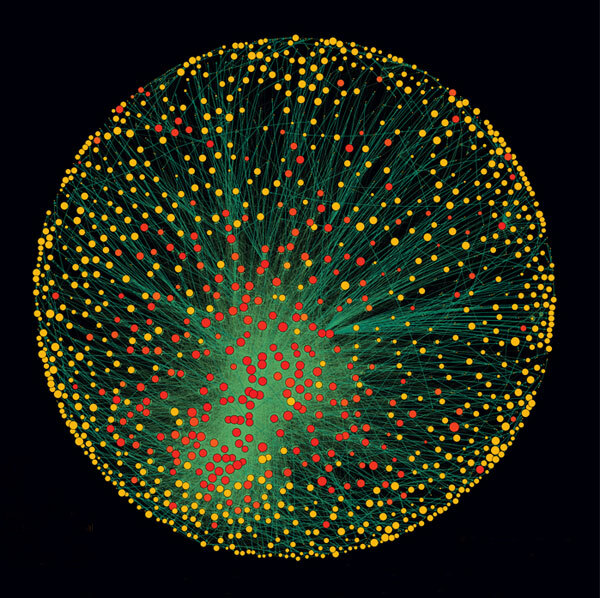 Studies by other complex systems theorists have also shown the vulnerabilities of complex systems with a high degree of concentration for systemic crises and collapse. The problem of concentration is what we really should be talking about, but what does Zizek suggest the OWSM and other critics of the current system do? Zizek hopes the OWSM will focus on a clear goal such as universal health care. With that example he shows himself to be an old school statist, with the ultimate task of the OWSM to focus itself on asserting control over the state for the purpose of social justice. Social justice is a great end in itself, but I think he misses what are the most amazing aspects of this movement which are 1) Its embodiment of participatory democracy, 2) The idea that networked groups can provide not just governance but social goods themselves, 3) Their international aspect, 4) Their critique of the current global economy as a system. What the OWSM shares with many “main-steam” Americans is not a desire for a more active state, but an innate suspicion of the state, and the perception that the system is not only rigged, but doesn’t really work- at least not for the majority. The reason the majority feel the system is broken is because of real-world concerns over unemployment and stagnant or falling living standards.